Supply your master suite with storage and style by introducing this chest of drawers from the DuBerry collection into its decor. 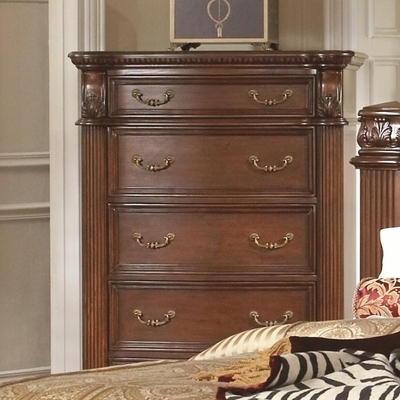 Crafted from mahogany solids and veneers, this traditional drawer chest features a rich brown finish, reeded pillar accents, and decorative metal hardware that is sure to fill any home with sophisticated warmth. The five spacious drawers provide the perfect place to keep clothing tidily tucked away. Dovetail drawer construction and full extension glides make the storage space sturdy and sleek. Fill your master suite with fashion and functionality by bringing home this chest of drawers, from the DuBarry collection.